Creative Recreation is one of my favorite shoe brands and for good reason; their styles are original, edgy, and owner Rich One is a very good friend of mine. For those who don't know, Rich "One" Confinco has been in the shoe industry for years, formerly designing for Vans, launching other boutique shoe brands, and finally, grinding on Creative Recreation for somewhere around a decade. Rich One is a ultra-talented artist who has designed art for many of his neighborhood homies including the first 12" single cover for Up Above Records "Can U Hear It," the first 2 Visionaries album covers, and the Visionaries "Eyecon" logo. Rich's circle of friends and family include the Beat Junkies, Visionaries, and the owners of Crooks & Castles. While everyone knows that I'm a shoe head, well, Rich One is one of the O.G. 's when you're talking sneakers, probably about a decade and a half appreciating kicks before the "sneaker craze." Uber-Creative design in footwear for your Recreational activities. 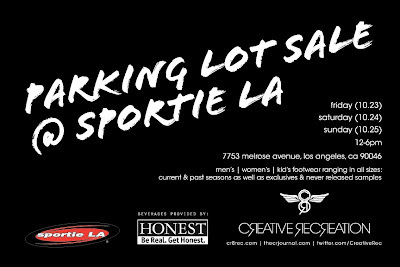 Well, here's your chance to scoop some CRecs up at a "Parking Lot Sale" at Sportie LA. I saw one of my students wearing creative recreation! I didn't realize how far the talent and style of creative rec's spread, and still don't. These guys rock, and insiders know it! How do you do? Hope you are well. Thank you for sharing this information enjoyable. Last week, I bought a number of Vans shoes for the whole group ..
is very cheap and I get within 5 days. The quality is very good. The site also sells shoes and all kinds of Vans shoes. Do not forget to tell the good things with your friends. So if you're interested in what you can get an overview. I think you'll have some surprise.